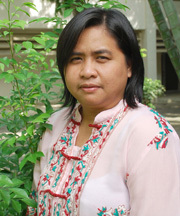 Worawan serves as Senior Programme Officer of AIT Extension. Her responsibilities cover design and development of training programmes and learning activities in the area of public administration and public sector policy implementation, such as infrastructure, agriculture, public finance and poverty reduction. Worawant works closely with programme directors to lead coordination and implementation of international training programmes and capacity development activities sponsored by DFID, World Bank, ADB, GIZ and UN agencies. During 2016-2019, she has served as Programme Coordinator for AIT and Ministry of Pubic Administration, Government of Bangladesh collaborative trainings for pubic service officers. She also served as Focal Point for training and development collaboration between AIT Extension and Indonesia Agency for Agricultural Research and Development (IAARD) aimed to enhance capacity of research personnel to implement projects under World Bank’s funds. She played the same role to conduct training programmes for agriculturalists and rural development scientists for the Ministry of Rural Rehabilitation and Development, Government of Afghanistan. Worawan was assigned to be Principal Coordinator for the cooperation between AIT Extension and Construction Development Corporation Limited (CDCL), Government of Bhutan. She has conducted series of training to assist CDCL’s engineers to have practical knowledge to manage and supervise road and bridge construction projects in Bhutan. During 2009-2011, she worked as Co-Facilitator of AIT Extension for Managing-At-The-Top-2 project funded by DFID, Ministry of Establishment, Government of Bangladesh. Worawan earned Bachelor Degree (B. Arts) English, Faculty of Humanities and Social Sciences, Khon Kaen University, Thailand in 1992. Master’s Degree (M.Ed.) in English from Faculty of Humanities, Srinakarinwirot University (SWU) Prasanmit Campus in 1999.